The shield represents a Canadian football field viewed from above with the 10 yard lines defined by the bands of green and gold. The colours are the team colours of the Edmonton Eskimos, the Canadian Football League team for which His Honour played and starred. The green band symbolizes a swift path across the field, while the three gold footballs refer to the speed of his advancing the play. The white horse is a reference to the Calgary Stampeders, His Honour’s first football team. The wings refer to His Honour’s nickname, “the China Clipper”, earned from his energetic play, and derived from the airplane of the same name. 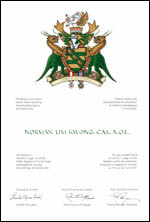 The rose refers to Her Honour Mary Kwong, an avid gardener who has played a singular role in His Honour’s life as his loving wife and greatest companion. The white circlet with red flames symbolizes His Honour’s long involvement with, and ownership of, the Calgary Flames hockey team, the colours of which are the national colours red and white. The supporters are two mythical creatures which have been named “Lim dragons”, referring to the Lieutenant Governor’s Chinese heritage. They are made from the upper part of a Chinese dragon and the lower part of the Albertosaurus, a dinosaur named for the province. The grain fields represent one of the province’s important and historic sources of wealth, while the wild roses are the provincial floral emblem and refer to His Honour’s family. 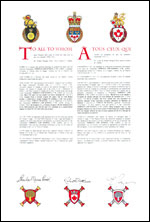 The announcement of the Letters Patent was made on October 6, 2007, in Volume 141, page 2826 of the Canada Gazette.